To replace the Output shaft seal for IH Scout II with Automatic transmission. Between the Output shaft and the Transfer Case. Note this double-flanged seal has been unavailable for many years, and we are unable to get one! This tried-and-trusted solution works well. 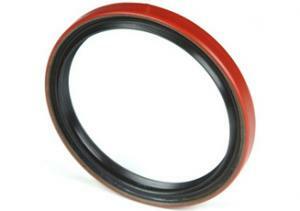 Put these two single-flanged seals back-to-back, and you'll be able to get your job finished!